We have been visiting the Greek Islands for over thirty years and during this time many islands have been exploited and spoilt. Amorgos is an unspoiled treasure and we enjoyed our holiday immensely. We have found the holiday travel arrangements to be very well organised (ferries, taxis, hotels in Athens and Amorgos) and the time on Amorgos to be very effectively structured and run. We had a holiday we rank as one of the best we have had. At first we felt that the Amorgos holiday was expensive, but afterwards we felt it had been well worth it. We found Paul & Henri to be very capable, considerate and knowledgeable guides. We feel sure that there are many people who would find it an excellent holiday, and as word gets round about how good it is, we are sure numbers will increase. Listening to other people telling the stories of their holidays, we feel sure that Paul and Henri offer something quite distinctive and special. We thought that it was an extremely well-organised holiday, run by very capable leaders in a wonderfully unspoilt area of Greece. The hotel was comfortable and the local people friendly. 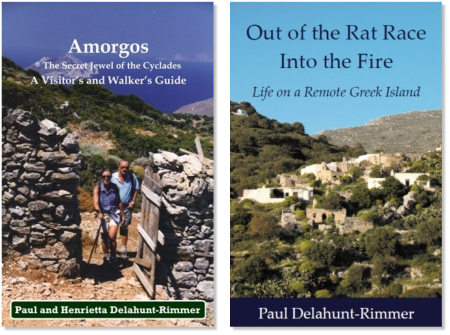 Over several years Paul and Henri have made an extensive study of the island of Amorgos even to the extent of making it their home. They are dedicated to the notion of eco-tourism, a value which we share and would hope to see promoted. The walks are well researched and adapted when necessary to suit the capabilities of different grades of walkers, simultaneously if necessary. Even the day in Athens was meticulously planned to give us an enjoyable day strolling through the back streets below the Acropolis following a walk described in a brochure prepared by Paul and Henri. We thoroughly enjoyed our holiday and would like other people to have the same opportunity. and last and most of all, the excellent advice, support and fellowship provided by our hosts Henri and Paul. This holiday in my view is outstanding and I've recommended it to many People. We went on our very first walking holiday with them in August; rather ambitiously (we felt). At no time did we experience anything less than friendly and professional help. There was no problem when I wished to "wimp out" on a couple of walks; in fact Paul made a special detour on one drive across the island so that I saw the monastery without having to climb to it. We found Paul and Henri to be not only knowledgeable and enthusiastic about the island but also excellent company. When the ferry return was delayed due to bad weather, they efficiently re-organised the transfer and the necessary overnight stay in Athens. Anyone who has travelled to Greece knows that there can be problems with ferries and will take that into account when planning a holiday. I can only reiterate that we had a wonderful time on Amorgos with Paul and Henri and were hoping to return some time. We holidayed in Amorgos earlier this year being looked after locally by Paul and Henri. Their local knowledge of the people, the Island's walks, its history, flora & fauna and the general way of life and customs, added greatly to our immense enjoyment of the trip. It is becoming increasingly rare in today's world to locate holidays in such unspoilt surroundings as are to be found in Amorgos. The peace, tranquility and beauty require to be complemented by a sympathetic appreciation of how best to enjoy and absorb such wonderful surroundings. The holiday is rather unique. Walkers enjoy the freedom of landscapes, but also enjoy optimising on a new experience by the knowledge provided by individuals who know the best routes, most attractive views and sights, and where one may enjoy the best local hospitality and choice of island cooking. This information was comprehensively but unobtrusively provided by our guides, Paul and Henri. Absolutely excellent holiday, remote, great guides, great company, lots of laughter. A holiday to remember. Thank you for your company; your local knowledge and insights added considerably to the value and enjoyment of our holiday. Amorgos is indeed a beautiful island, combining dramatic and splendid vistas with tranquillity and the endearing warmth and friendliness of the Amorgians. Seriously, Kate and I have not stopped talking about how thoroughly enjoyable the whole experience was and our holiday photographs only served to remind us of what a good time we had on the island.Thank you again and please convey our very warm regards to Anna. A somewhat belated thank you for the superb holiday we had in Amorgos. We really enjoyed all the wonderful walks, the views, the many churches & the flowers. You certainly made it all extremely interesting & relaxing as we didn't have to think for ourselves at all, just what we were looking for. Our ferry trip back to Athens was superb, so hot we had to alternate between the deck & the shade. You no doubt heard from Dimitris that we eventually arrived in Piraeus about 5:30pm, & he & his excellent driver got us to the airport in record time despite the rush hour (what a culture shock after the cobbled paths & donkeys of Amorgos).